Fri, Sep 7, 2018, 12:06 pm SL Time, ColomboPage News Desk, Sri Lanka. Sept 07, Colombo: Sri Lanka's Prime Minister and the leader of the United National Party Ranil Wickremesinghe says the party is grooming a new generation of leaders to take over the leadership in the future while strengthening the party. "I have groomed the next line of leaders who would take on the party as it is time for the party to now think of its future beyond the 2020 elections," the Premier said yesterday addressing the 72nd Anniversary of the United National Party yesterday. 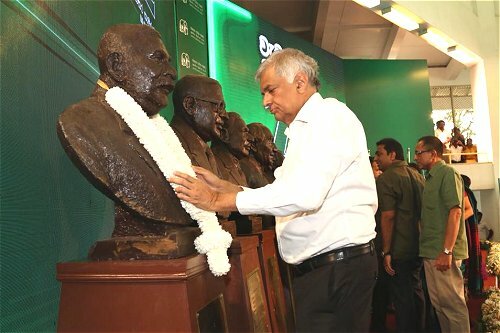 The United National Party�s 72nd Anniversary was celebrated Thursday under the theme "72 years of Work and Work to be done" under the patronage of Prime Minister Ranil Wickremesinghe at the Sirikotha party headquarters. Commemorating the past leaders of the United National Party, the Prime Minister garlanded their statues. Many party stalwarts including Ministers and Parliamentarians joined the occasion. Speaking at the occasion, the Premier said the founder of the UNP D.S. Senanayake, when he formed the party said the party is created to form a government and build the country if it wins, and to defend democracy if it lost. During the last 72 years the party has done both tasks. "D. S. Senanayake, Dudley Senanayake, John Kotelawala, J. R. Jayewardene, Ranasinghe Premadasa, D. B. Jayatunga led this party and won. When defeated, the party was defended. We faced the terrors in the North and the South, but the party remained strong. UNP is the only rooted political movement in Sri Lanka." "The UNP will not stop here, we will take our mandate forward, we will build this party from the grass roots upwards and we will clinch the leadership," the Prime Minister said. The Prime Minister further said that they took over power in 2015 not as a UNP Government but as a national Government to resolve the problems country has faced. "We took over power during a very difficult period. This country, when we took over, was like a barren paddy field burdened with debt,� he said. "Due to heavy debt, the paddy field had to be sold. As such, the old owners of the paddy field have escaped. The paddy field was not cultivated for many years when we took it. Many thought that the paddy field would have to be abandoned when unable to cultivate. We faced all the hazards of debt, drought and floods. But we did not forget to sow our paddy field. Now it's harvesting. Let us give this harvest to our supporters and to the country." The Premier said the government also carried out development work in the country while taking measures to relieve the country from debt. He stressed that they were working on a program to secure an economy that could repay loans for the next generation by the year 2020. "The university student allowance was increased from Rs. 2000 to Rs. 5000. Laptop computers were provided to university students. Buildings have been provided to 9000 schools under the "Best School is the Nearest School" Program. Also, 4000 principal vacancies were filled. The school students were insured. We did all this even before we reaped the harvest of the paddy field that we took over." "We reduced the prices of medicines, stated the Suva Seriya free ambulance service, and started 10,000 housing schemes. We increased public servants' salaries by Rs. 10,000 in our first budget. The fuel prices were reduced, and we regained the GSP Plus duty concession. We increased women's representation in elections. Above all we worked to create democracy in the country. Today our country is a democratic country. Today there is no issue with democracy in Sri Lanka." "The Hambantota Port had become a white elephant at that time. Today, Hambantota has become an economic hub. The Mattala Airport too will be made a success. We should remember that these works are done with great diffiuclty. Taxes had to be increased. The prices of goods have increased. When there are problems in the economy, it is felt in many sectors. All this was done for the country, to build the country. We will continue this program targeting to create an economy that can pay off loans, not to leave a debt-laden economy for the next generation by 2025. "We have launched the Gamperaliya and Enterprise Sri Lanka programs to develop the villages. There are more programs need to be launched. We have started a program to create Jobs," the Premier said. "Facing all these problems, we are gradually moving forward with all this work, and we are successfully ending this journey. We are now planning to win the next election and make a developed country by 2025 and also to succeed in 2030." 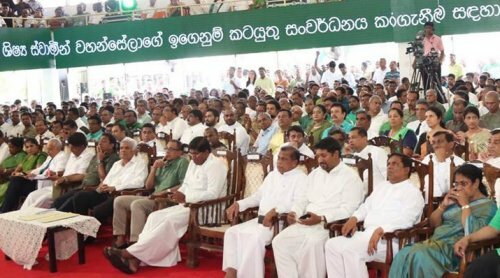 Addressing the 72nd anniversary Deputy Leader Sajith Premadasa said, the UNP will become the pioneer in the development drive of the country. Minister Akila Viraj Kariyawasam said that no one was able to weaken or destroy their Party. The Party is still young. He added that the most beneficial election for the Party is the Presidential election. This is the election that will come in another one and a half years.